Once again, another bad summer leaves us desperate to continue the season for as long as possible, in the hope that one good session will make up for all the miserable weather we had this year that stopped us getting out on the sea. This was my first ever trip for sea bass in October and I'm pleased to say that it was a success. I'm now back, with aching limbs and back, having had the best session of the year. Another spirited bass comes to the yak. The autumnal weather was glorious, more summer than autumn, with bright blue skies and a steady warm breeze. Water clarity wasn't great as usual at this time of the year. It was more milky green than milk chocolate, and although sporadic brown chocolate patches that seem to appear and disappear as the tide swings round were there throughout the session, they certainly weren't enough to put the fish off. This year has really been a revelation for me concerning soft plastics. 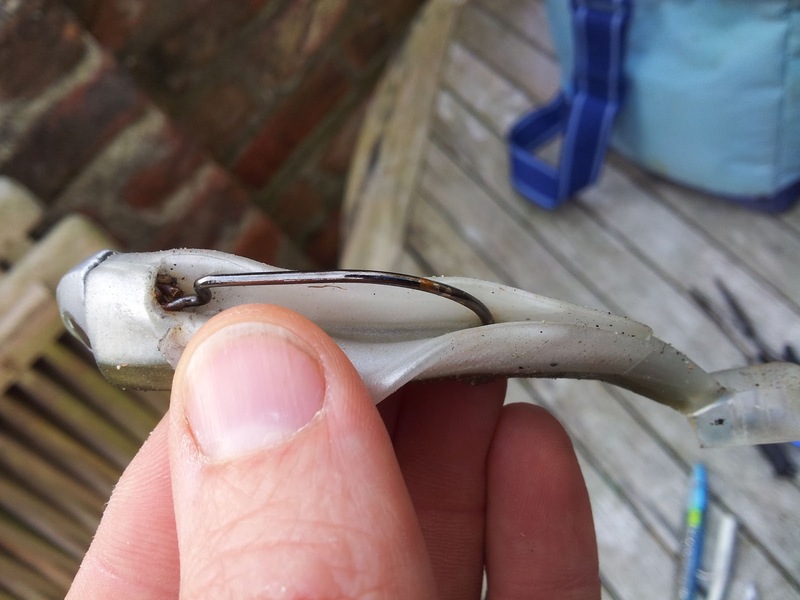 After last year's nightmare of getting a treble hook deeply embedded in the end of my thumb and nearly passing out trying to rip it out with a pair of pliers, I've found that I'm reaching for my hard plastics (often with three sets of treble hooks) with a certain reluctance. Small bass are a nuisance in the kayak and in my opinion, so is a net. Most soft plastics fish with a single hook which is a great advantage when you've got a frisky young bass thrashing about between your legs in a kayak. You really don't want a set of needle sharp trebles getting stuck into anything down there, including your expensive dry suit or otherwise! But soft plastics also catch fish. In fact, I am coming round to the opinion that they will out fish hard plastics on most occasions. And finally, while hard plastics are undoubtedly works of art, they are very expensive. Yes, soft lures will never cast as well as a good plug from Duo or Megabass and from the shore that's a problem, but they are a third of the price. That's a big incentive when it's so easy to lose a lure to snags (pot rope anyone? ), and when you add the single hook benefits for kayakers and weedless rigging, you can see why I've been reaching for the hard plastics in my lure box less and less often this year. 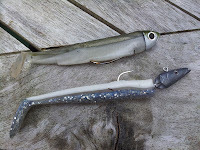 I previously mentioned how good a lure SavageGear Sandeels are for cod, pollack and sea bass. The different sizes let you fish for all three, and you can buy replacement heads for them. 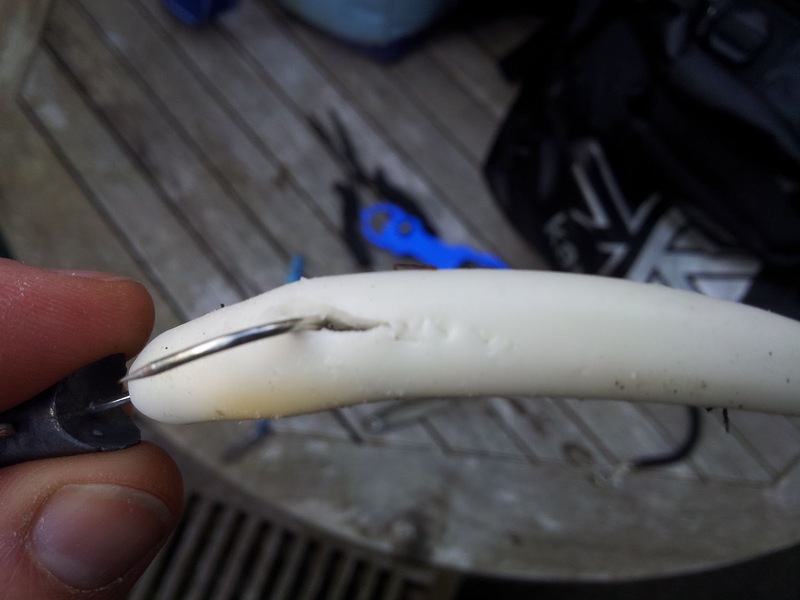 The one great weakness with soft plastics, and this is something that particularly affects SavageGear Sandeels is that the soft plastic is easily damaged by repeated casting or by the mouths of fish. I'd estimate that the 25g SavageGear Sandeel lasts at most for four fish before it's too badly ripped to continue using. Of course, your mileage may vary - you might have it ripped after a single fish. On a busy day, when you're getting a lot of schoolies, this can get annoying as you can go through several packs quite quickly. Both the models pictured here (120mm) are suitable for using from the kayak. I probably prefer the 12g model, as you can work it more realistically over shallow ground, as I'll discuss later. Anyhow enough about the Black Minnow, let's get on with the catch report! The sea was a little bit too lumpy arriving at my chosen mark for my liking, but as time went by and the wind dropped, the sea flattened off and made it very fishable. Indeed, as the tide picked up, I started getting fish to my sandeels on a regular basis. Nothing huge, but at least I was catching. But after five or six fish, and three body changes on my SavageGear Sandeel, I just ran out of the 25g size. I didn't want to go heavier (42g), as it was only a few metres deep, probably less if you include the kelp, so I decided to give my new lures from Fiiish a try. 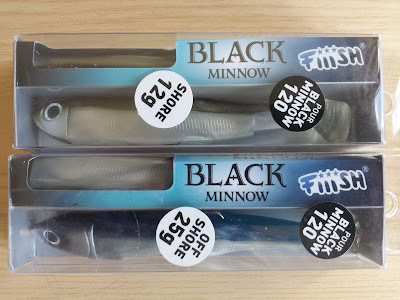 The Fiiish Black Minnow 120 has an ingenious method of attaching the soft plastic and the hook, which leaves both the hook and plastic free to move about. 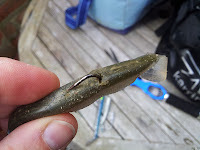 Whether this really contributes much to the lure's action I can't say (doesn't look as if it does), but where it gives the lure a big advantage is that the lure is pushed up out of harms way when you hook a fish. As the hook is not actually embedded in the lure (it goes into a slot in the body), there's nothing to rip out, and as a consequence, the soft body lasts much longer than most soft plastics. I started to get quite a few fish on it. Some were decent fish, around the 55cm mark. Over the four hours I had maybe twenty fish. I even managed an hour out to try and get some cod over deeper water once the sea had flattened off. But I am cursed this year for cod! Yet again the cod wouldn't show and I still don't have a single cod in my freezer - very frustrating year. A couple of small pollack were all I could find while having my "time out" for cod, so I gave up and went back to the bass, catching another five or six more before calling it a day. All in all, a great way to end the season. And a fantastic new lure to add to my collection. I'm convinced this type of lure is the future, at least for kayak anglers where casting distance isn't an issue and where landing fish (without a net) can be dangerous when there are stray treble hooks flying about. 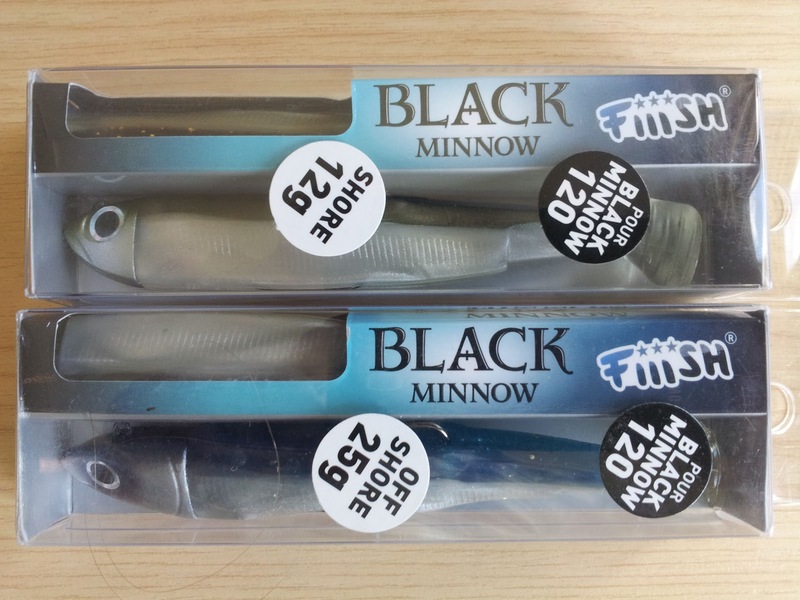 The Black Minnow is a very clever design, and for me it's probably the best soft lure there is at the present moment. I'll definitely be adding some more to my collection this winter! Tight lines to all those still fishing. Nice fishing and report Kester - what a buzz that must have been. I can see how the BM would be perfect from the yak - really is a terrific lure... problem is getting hold of them as more and more find out about 'em! Yeah, there's been a bit of late season run on them. But they'll be ample opportunity to stock up over winter. Think I'm about done for this year. Weather just starting to nip a bit early morning. Might possibly get one more go, but if I don't at least I had this session. But cod for me this year has been terrible. I like sea bass, but cod for me is still my main target - will try and sort out the early season fishing next year. There is a big cod size BM which I'm keen to have a go with. Sick of catching pot ropes with lures that cost 3 quid each! Ya seguro que no te acuerdas de mi,hace tiempo que no visito tu blog,pero ahora vuelvo con muchas ganas,ya que despues de mucho tiempo he comprado un kayak y disfruto muchisimo como tu. Ese señuelo blando,no lo conozco,mas bien pesco con los savager,viendo lo bien que te ha funcionado,sera uno de mis proximos señuelos. Increible jornada en la que disfrutaste muchisimo,enhorabuena por esas preciosas capturas. Un Abrazo y espero no haberte dado mucho la lata. Hiya Juanrra - of course I remember you! Great to hear you've got a kayak. It'll change your fishing results for ever, I promise! 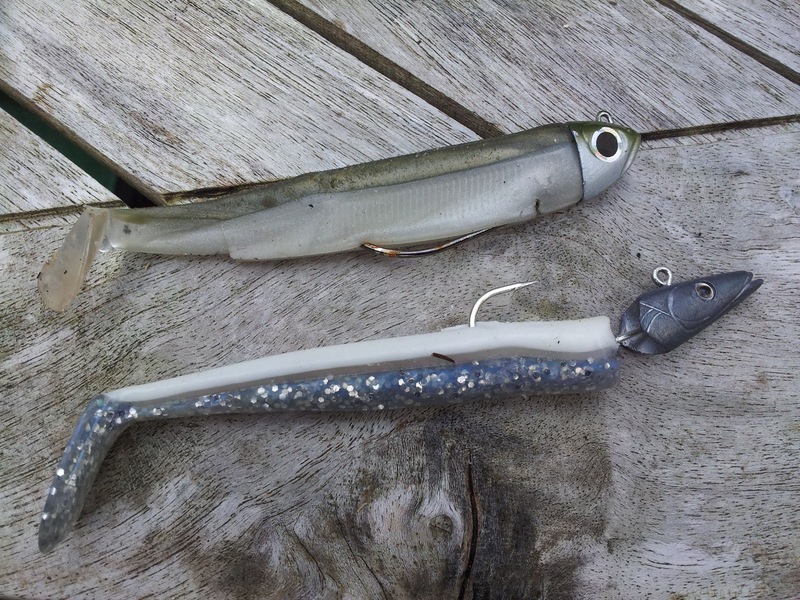 The Savage Gear sandeels are good, but the Black Minnow is better, trust me! Better design, longer lasting, and catches plenty of fish. I recommend fishing it "sink and draw" for best results. Unfortunately our season has come to a close now. Hope you can still get some fishing done.